The Vortex Layer device is a versatile device, applicable in many industries. The device is of interest to many scientists, theoretical and practical, since it intensifies various chemical and physical processes. The analysis of factors of the vortex layer allows to estimate the action of the vortex layer on certain chemical reactions. Due to electrolysis occurring on the surface of the ferromagnetic particles, the influence of the electromagnetic field, cavitation and other features of the vortex layer, products of entirely new properties can be made. Let us describe the research into the production of nano-modified concrete. The main problem of modern construction material science is the production of high quality concretes. The solution may be found due to modification of the cement stone structure, using more of the potential of crystalline hydrates, improving the interaction of all concrete components. One of the most promising directions of concrete quality research is the use of nanotechnology in its production. The research was applied to the widely used fine grain concrete mix. 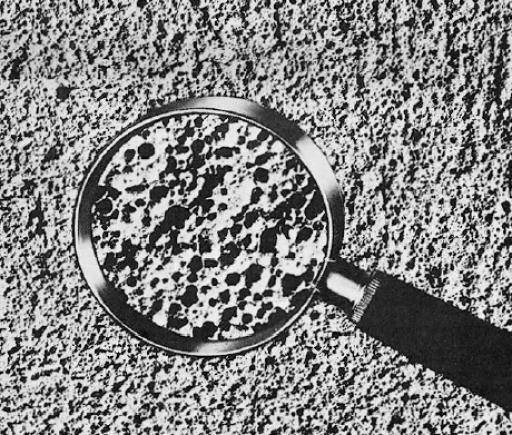 To ensure unform distribution of the concrete mix, including the nano-additives, four test mixings were performed in the AVS-100 vortex layer device. To intensify the mixing process, polymer-coated ferromagnetic elements were used in the device. In all other mixings the device was used only for magnetizing of hardening water. Solutions of the same composition were prepared using the same aggregate, with the 1:3 ratio of components. Water-cement ratio changed from 0.6 (for samples hardened with magnetic water) to 0.8 (for samples with regular water), percentage ratio of nanomaterials was from 0.5% to 2%. Treatment of water in the alternating magnetic field was 2 to 5 seconds. The results of the research showed that even small portions of carbon nanoparticles improve a range of concrete properties. It has been determined that the samples with the maximum strength has 1% of additive in the mix. Generally, strength peaks with nanomaterial content from 0.5% to 1%. Strength of nano-modified samples exceeds that of control samples by 5.8 for compression and 5.1 times for flexing. The results of the research is shown in Figures 1 - 3. The graphs show that the samples prepared using only magnetic water, are 20-25% less durable. This is due to the improved quality of mix preparation in the vortex layer. Additive content over 1% shows decrease of strength, both flexing and compressive. The results of the experiments show that nano-additives influence the strength of concrete mix and concrete structure formation significantly. There is a reason to suggest that nanomodified concrete will also demonstrate better strength and durability. In general, the research confirmed the potential of using carbon nanoparticles in concrete and their activation in the AVS-100 device.